Holly discovers a garden and its mysterious owner in the jungle. 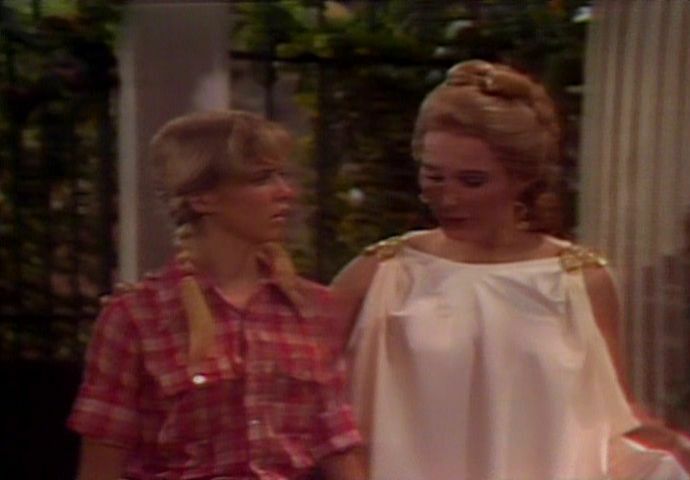 At the beginning of the episode, Holly calls Cha-ka a chicken. She should have called him an iguana, as we learned in "Babysitter". Cha-ka admonishes against going down the river in the canoe because "...no one always come back." Which Will corrects him, "you mean no one never comes back." Uh, no, Will...that would be "no one ever comes back." Did you forget the rule against double negatives in English? Speaking of the river, is this the same one as seen in "Downstream"? If so, the Marshalls should already know that the river just loops around on itself. 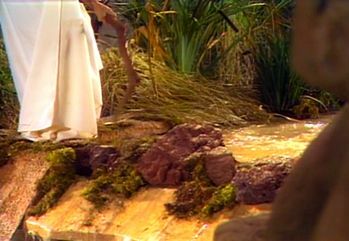 In fact, given the closed-universe nature of the Land of the Lost, all rivers would basically do the same! Cha-ka and Will make references to "Nice Day", discussing the time they went fishing together. At 2:18 on the DVD as Meddy is clearing debris from the river, it is obvious that the river is actually flowing through a man-made trough or aqueduct of some kind. I suppose it could be a remnant of Altrusian (or other) civilization. It is obvious the Medusa is wearing lifeless rubber snakes for hair. Holly doesn't seem surprised to meet a strange woman in the jungle. At 7:51 on the DVD, Meddy pours two glasses for herself and her reflection. When she picks up her glass, as the camera angle changes, the second glass is gone! Is it because her reflection picked it up on the other side of the mirror? 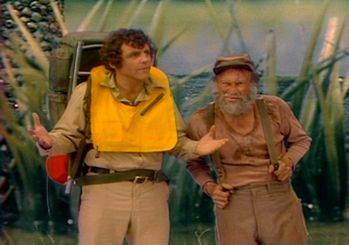 From Holly's words, Jefferson Davis Collie III, the rebel soldier of the U.S. civil war from "Downstream", was intercepted by Medusa at some point between then and this episode and became a permanent fixture in her garden. The statue used as a set piece here does not really look much like him though. I suppose it's because I'm a guy that I noticed this, but from 14:03-14:10 on the DVD, it appears that Marion Thompson, the actress playing Meddy, is not wearing a bra and her areolae can be vaguely seen through the white fabric of her gown! Jack is unable to see his reflection in Meddy's magic mirror (like when Meddy's reflection got mad and refused to show for her). Would his own alter-ego reflection have eventually popped up if he had looked at the mirror long enough? How did Medusa become trapped in the Land of the Lost?